If you saw the HBO mini-series, Band of Brothers, or better yet, read the book by the same name, you probably remember Sergeant Darrell "Shifty" Powers. 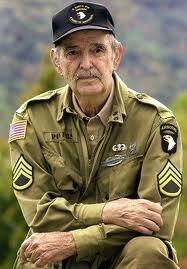 He was one of the original members of Easy Company. He holds the incredible distinction of being the only soldier from Easy Company who fought in every major campaign but was never wounded. Shifty was also considered to be the best rifle shot in the company and he was sometimes used as a sniper. The book is written in the first person. The author spent enough time with Shifty during the interviews that his friends and family felt that the author captured him brilliantly. Shifty grew up in rural West Virginia. As a young boy, his father taught him to hunt and fish. Shifty's dad also helped him develop his woodcraft skills that would serve him well later when Shifty was hunting German soldiers. There are many familiar characters here: Captain Soebel, Major Winters, Lieutenant Spiers, Lieutenant Compton, and so many others. Shifty describes what it was like for him being combat day after day. Shifty's tenacity and dogged determination brought him through World War II unscathed physically. It is impossible, though, to go through all he went through and not be scarred mentally and emotionally. The narrative also provides a wonderful account of Shifty's return to the US. This is the story that we often do not hear about WWII vets because it was a different era. Men did not talk about their internal struggles or their feelings. Shifty was a good man and he knew that if he did not defeat his inner demons, they would defeat him and he would lose his family. Shifty's faith in God pulled him through a dark time and brought him healing. Most military books lift up the generals as heroes. Here is a great story about a true American hero. Shifty was a regular guy who fought in the trenches, doing his duty, day after day. As a sergeant, he did what he could to keep his men safe. As a husband, father, and grandfather, he was a man that we all can relate to. Thank you for your service, Sergeant Powers!